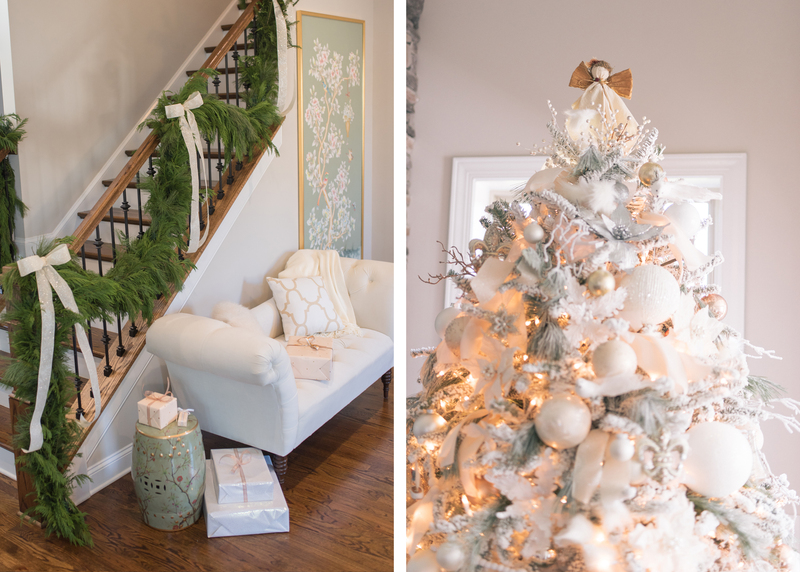 Today I am giving you guys an inside look at how I decorated our home for the holidays! 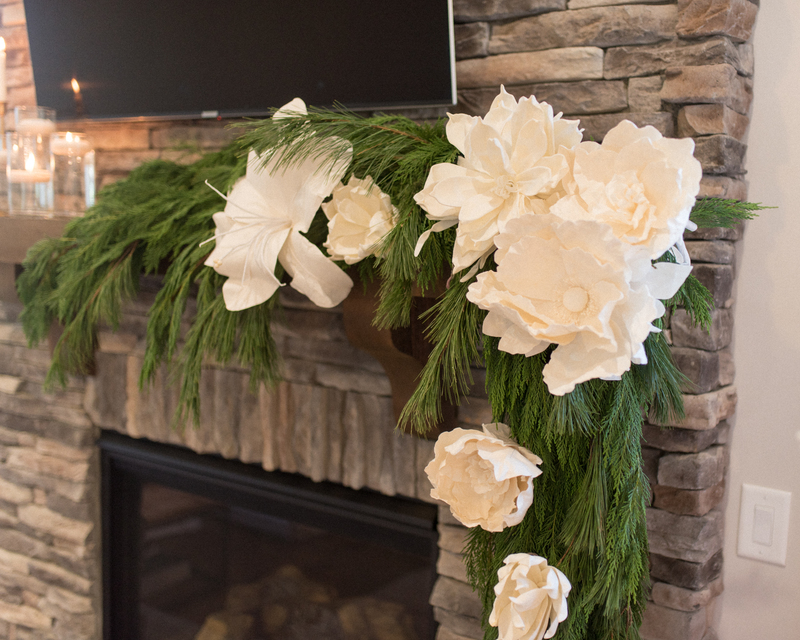 Unlike our exterior decorations, the inside is much more neutral. Justin and I are hosting our family this year for Christmas, so we want the house to be warm and welcoming. 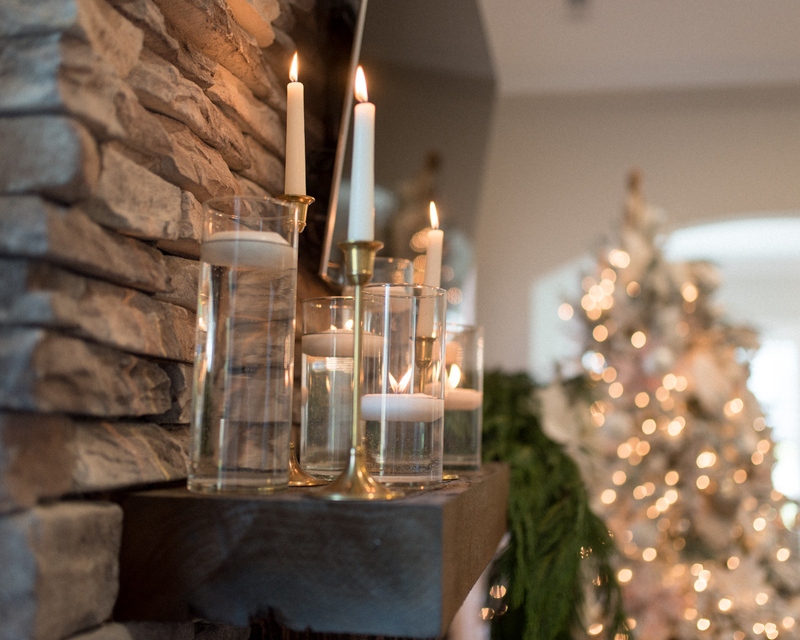 What we lack in furniture we made up for in holiday cheer – more on that below! We went with a real, flocked Christmas tree for the third year in a row. The smell is incredible and makes it feel that much more authentic! It’s become a tradition to purchase our tree on Thanksgiving day. After spending the afternoon with our family, Justin and I head over to Willie Simpson’s Tree Lot on Kings Drive to pick out the perfect tree. Since I have an affinity for white and neutral tones, red and green Christmas decor just doesn’t cut it. 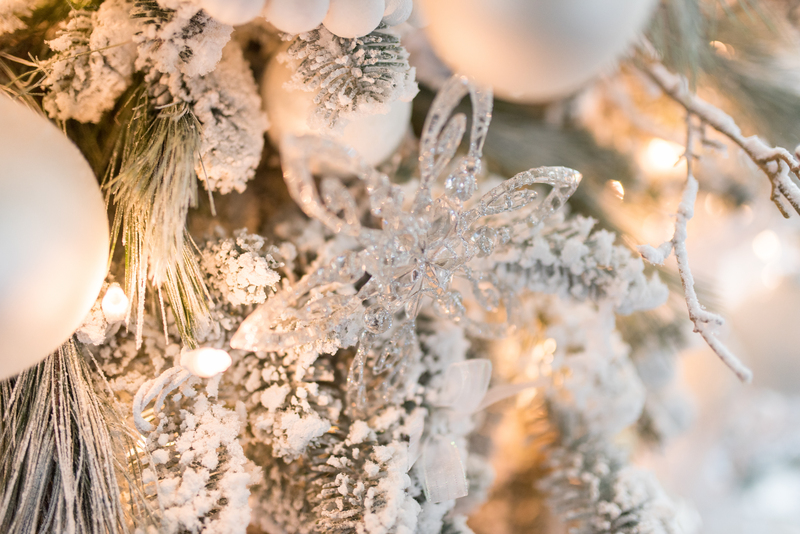 Instead we (mostly me) opt for textured florals, glass ornaments, ivory ribbon and champagne balls for a very “white” Christmas. 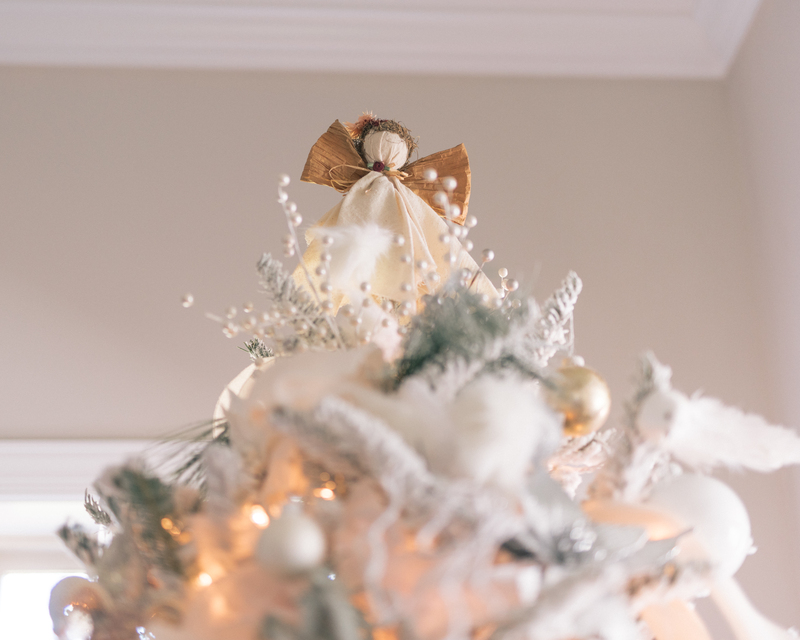 I made the angel atop our tree at an after school camp when I was in elementary school. It’s topped my moms Christmas tree every year for the past 20 years. You should have seen the look on her face when I asked if I could have it. If anything, borrow it to take these photos! She seemed so heartbroken that I couldn’t bring myself to keep it! 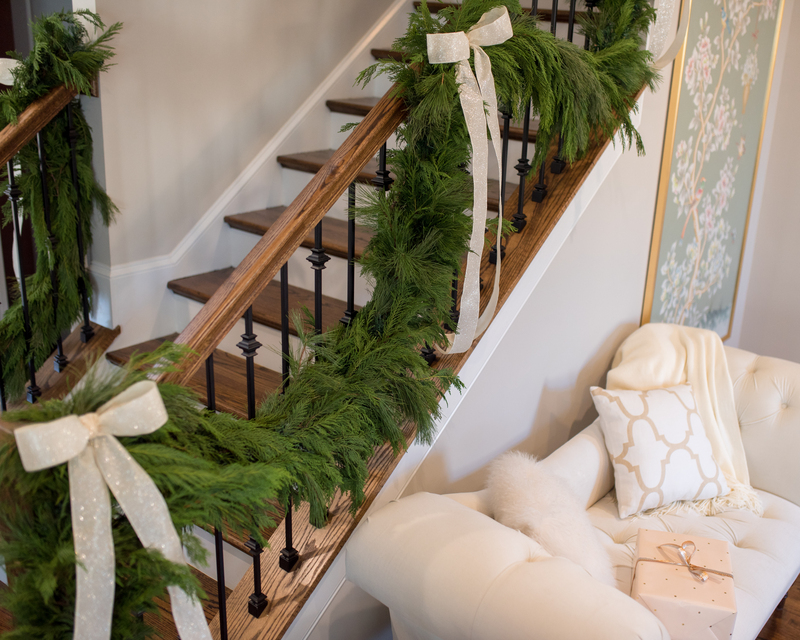 To tie in the exterior decorations, I used the same thick garland along our stairs and mantle. The cyprus has a whimsical, somewhat lace-y look that I love! Luckily, I had several spools of ivory ribbon left over from last season, so I used that to make the bows. Their long tails add a romantic touch, don’t you think? For the mantle I choose to ditch stockings on the mantle and instead and do an asymmetrical swag. More occasional than traditional, I added large paper flowers from Anthropologie (here, here and here). The side opposite the swag is littered with white stem and floating candles. 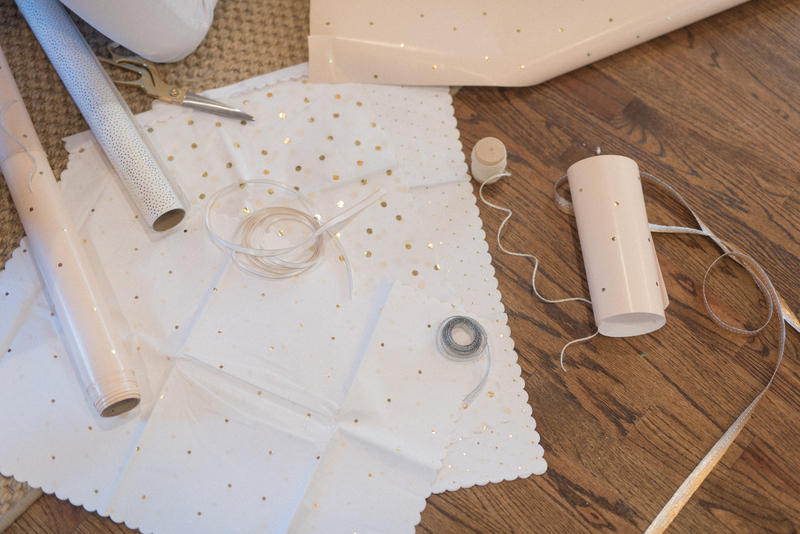 Sugar Paper partnered with Target to create an exclusive line of gift wrap and accessories for the holidays. 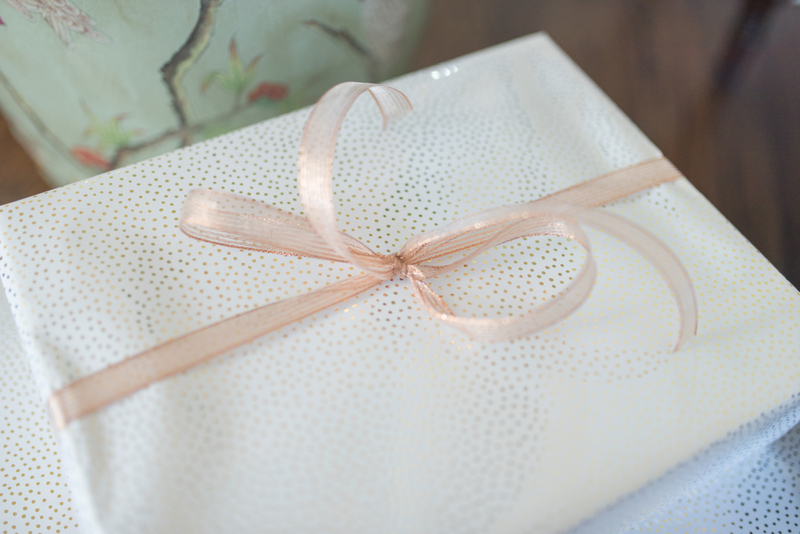 They have such a beautiful collection to choose from this holiday season including this white and pale pink dotted paper. 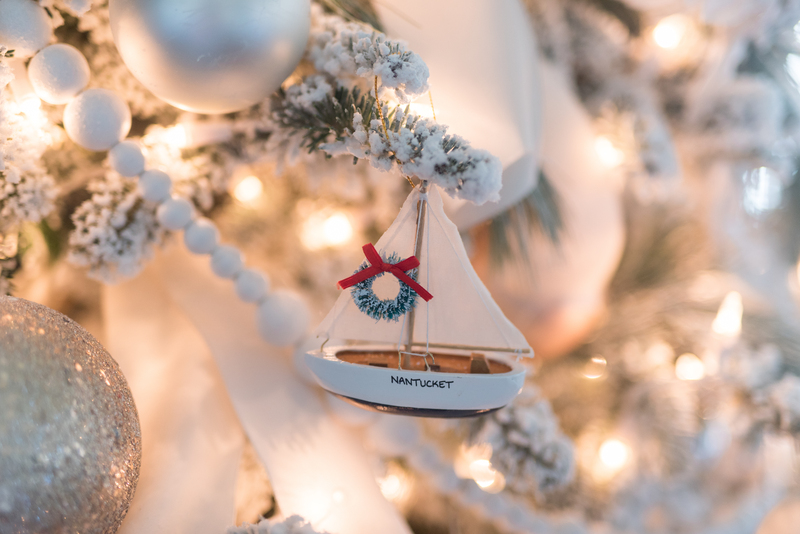 My favorite ornaments are those that we’ve picked-up while traveling. We try to remember to purchase one from each new place we visit. They’re a great conversation piece and fun to pull-out come Christmas. To me, the holiday’s are about family. No matter how busy we all are, it’s the one time of year when we put our own schedules aside and make it just about family. 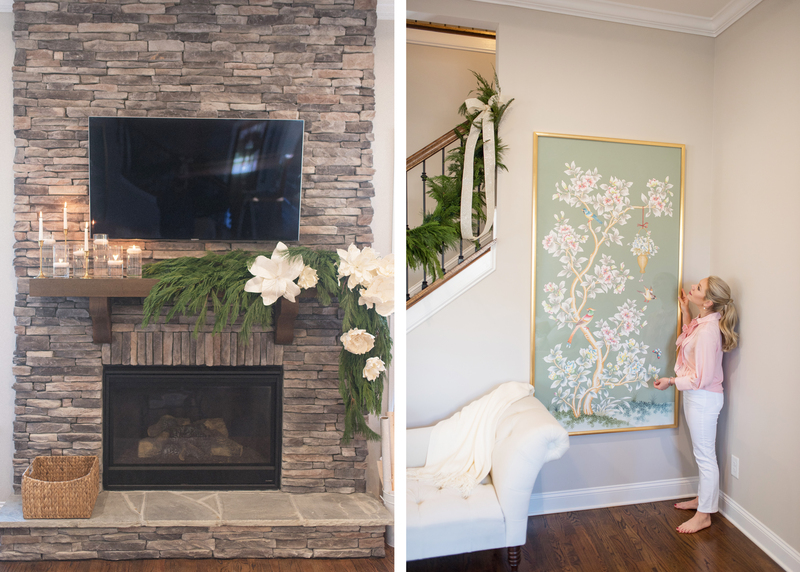 And, although, my living area is still a work in progress and I would love for it to look perfect when we have everybody over, it’s not about that! It’s about spending time with loved ones. 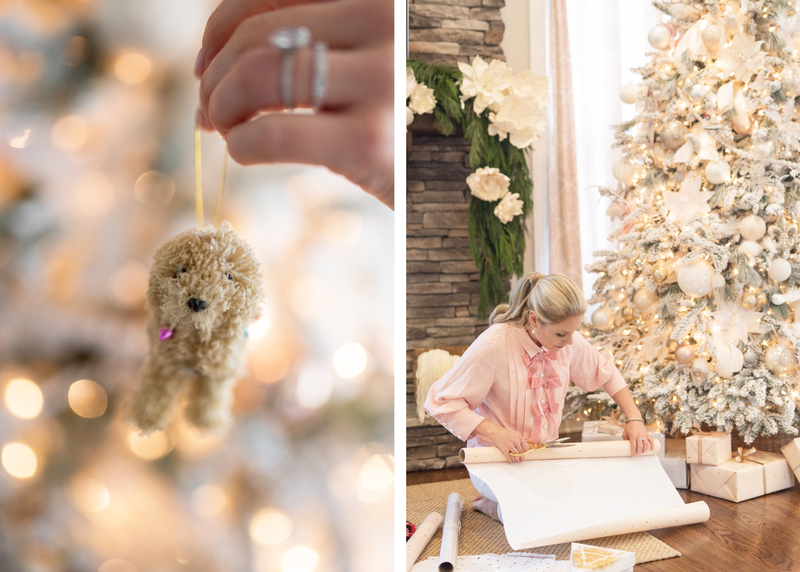 While I hope this post sparks creative decorating ideas this season, don’t beat yourself over making things perfect. 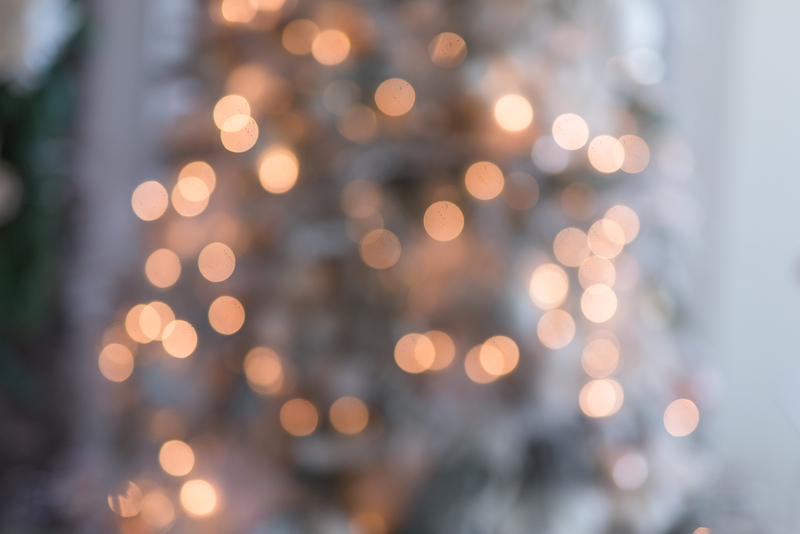 Decorating is fun, but don’t let it take away from the true meaning of the season! Cheers!